i m elisa.i m looking for roommate. we are two Chinese girl live in , 3-bedroom apartment, close to Metro line 5, Zhujiang new town in GuangZhou .It's in a nice new building, with lift on 12th floor. This room for rent is bright, clean, with bed, wardrobe, air condition and wi-fi provided. 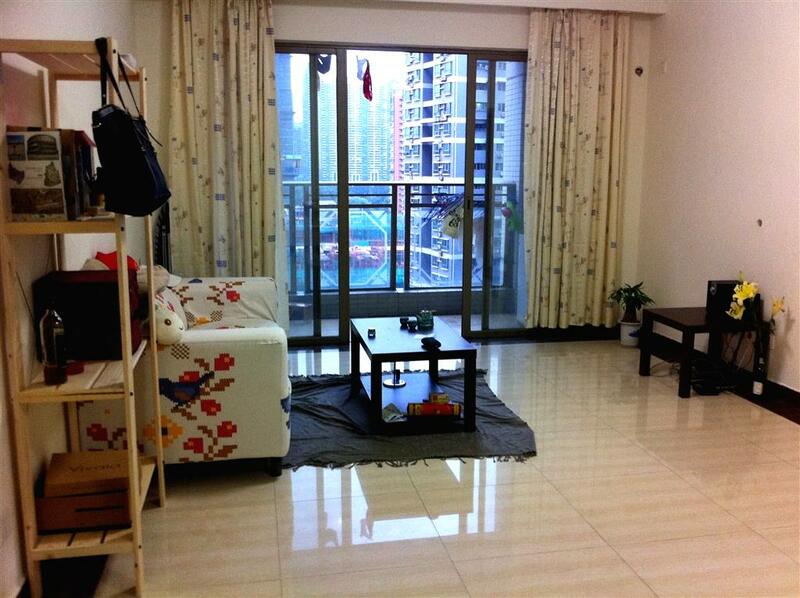 Rent at 1700RMB per month.if interested ,plz contact me .picture available. I am a Chinese girl, guangzhou local. Age: 25-30, I am currently living alone in shiqiao. I am looking for a flatmate to live with me starting from Mar, or April... My plan is to find a flatmate first and then look for a apartment together. Because, the rent here is good comparing to the guangzhou center. The transportation here is very convenient, it takes you 30 minutes to be in zhujiang new town.. There are a lot of grocery shops nearby and good restaurants. You can find most thing you need in your daily life here. If you want western stuff, you can go to “Metro", and maybe Clifford... And here, less people than in guangzhou center... but shiqiao, it is a center of panyu for me. Who will be the best flatmate for me? Gender and age are not the first consideration. I want a kind and honest person. Gotta be a normal person. lol I want we can do a language exchange if possible. I speak Mandarin, Cantonese and English. I want to improve my English, and I am interested in learning French ( knows a little bit now), and Spanish. For the chores, I hope we can take turns, gotta keep the apartment tidy. Honestly, I want to make a good friend with my flatmate. Keeping a friendly relationship between us is something I want. Lastly, respect is very important. We can arrange a meet up to see if we like each other. I am a man living in auyuan area in panyu near helenberg housing , do like to live with me in September and October? I am a 23 year old girl and I will be studying at SUN YAT-SEN UNIVERSITY B.S for a semester. I am a Kurdish man. I will be coming to Guanghzhou to study at Sun Yat-sen University South Campuse. I am looking room for rent around subway line 8. Is there anyone interested? please contact gmail.com|ugurozoral90 or +905342631593 wechat. my name is daniel.. 32 y.o I will be arriving in Guangzhou in January 14 ...I'm looking for a roommate with good price.